Take a look at this submission from Jim. A great [tag]drill[/tag] for [tag]basketball defensive efficiency[/tag] that can work with all age groups. 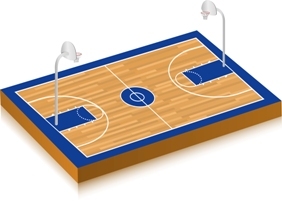 I have a [tag]basketball[/tag] drill for my [tag]centers[/tag] that I really think helps their eye/hand coordination and their quickness (to catch a ball that they don’t know where its coming from). I have them stand about 5-10 feet from a wall looking straight at it. I’m in the back, throwing the ball and [tag]bouncing[/tag] it off the wall from an underhand position from both sides of the player and keeping the ball coming at different levels or directly at them. As their reaction time of catching the ball improves so does the speed of which I bounce it off the wall. It has improved my centers’ [tag]eye/hand coordination[/tag] immensely, especially during games where we have [tag]guards[/tag] that throw them the ball without directly looking at them.